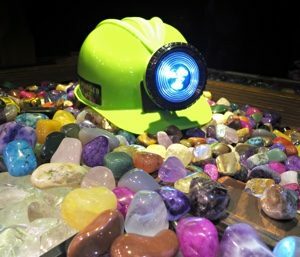 We have a one of a kind, interactive mine where your young miners can don a miner’s helmet with light, explore the mine, find veins of ore and learn about the minerals. Experience our UV lighted mineral room with walls that are embedded with naturally fluorescing minerals. We also offer a wide selection of reference materials on gems and minerals of the southwest to guide you through our mineral displays. There are wonderful gift items available for rock-hounds of all ages, including rock tumblers for the hobbyist and pro, collection boxes and your very own UV flashlight and six mineral kit.